I am currently co-teaching a course with Fr. Geoffrey Ready about death in the Orthodox tradition. One of the things we come up against in this course is the fact that death in our culture is kind of a black box–people go in, they die, a bunch of paperwork (right? ), then there’s a funeral. What happens in between? In addition to theological content, we want to give our students, some of whom are priests or priests-in-training, practical insight into that black box to aid pastoral ministry in the Church. With this in mind, Fr. Geoffrey and I have been trying to set up a meeting with one of the biggest funeral homes in Toronto to get to know them and possibly organize a field trip with our students. That’s how Fr. Geoffrey and I found ourselves sitting in the lobby of one of the biggest funeral homes in Toronto last Friday, which just so happened to be the Feast of the Elevation of the Cross. Symbolic? Deliciously. If you’ve never been to a funeral home before, or just find the whole prospect confusing, here are some signs to know whether you’re in the right place. You have been offered coffee or “something to drink” approximately 14 times in the last two minutes. Everyone who works there–even the women– is wearing suit coats and ties. The parking lot and driveway are covered with a huge, extended awning that seems both ominous yet also incredibly thoughtful. Why can’t all public parking lots have such an awning? We’d never get wet again. Everyone addresses you in these soothing, hushed tones and makes direct eye contact with you when speaking. At all times. There are an unusual array of brochures for burial plots and grief + loss. There are also an unusual amount of kleenex boxes. It’s quiet. I mean, *really* quiet. The people are just really, really nice–but without being smiley or bubbly or overly talkative. As an introvert, I just think funeral directors are the best! If one or more of these items are true, you are most likely in a funeral home. Jokes aside, it was a rather meaningful way to spend this particular feast day. After a tour of the premises, we had an extended conversation with the owner in which we discussed our course, cultural attitudes towards death, ongoing work in our area to establish an Orthodox burial society, the funeral industry today, and a whole bunch of other things. Full disclaimer, it just so happens this particular funeral home helped with my father-in-law’s funeral and burial this past May. At the time, I was completely caught off guard by how helpful and meaningful the funeral home staff had made things. They really added a dimension to my FIL’s funeral that would have otherwise been lacking. I think that funeral homes and their directors get a bad rap these days. We assume they are money-hungry people waiting to prey on families as soon as tragedy strikes. Yet most (certain all that I’ve ever met in networking for several death-related university courses) have good intentions and work every day on the front lines of a phenomenon most of us would just as soon avoid. The funeral directors who worked with my family knew (and seemed to respect) Orthodox burial customs almost more than we did. They did not flinch when we broached our options about embalming, they didn’t look at us cross-eyed when we interrogated their itemized price sheet. They made sure we had incense for all the prayers, that someone was taking care of koliva and bread and wine and oil for the funeral, that things were orderly and beautiful and (perhaps the biggest miracle of all in a large, Greek family) punctual. And, to some extent, that we all understood the theological significance of what was happening. So I was curious to meet the owner behind it all, who–to my knowledge–is not Orthodox. His name is G. He has the sober demeanor of a veteran funeral director who’s seen a lot. Pretty much off the bat, without our even asking any questions, G. said you can’t really make it in the funeral industry without some kind of faith in the resurrection. Or you can, he started, but… It will just be a business for you. You’ll never be able to face the real, human dimension of the work you do. Or you’ll burn out. You can only really face death with faith. G. explained that his funeral center excels in providing “traditional funeral services” for families in the area. By this, he means funerals in which there is a Christian religious element at the center. De facto, then, the vast majorities of folks they serve are either Orthodox or Catholic–fewer and fewer Protestants, he explained, really want a traditional funeral anymore. They may not even want a body present. Instead, they opt for celebrations of life that are typically shorn of religious context. “We always encourage people to do as much of the services for their loved one as possible in a church rather than at the funeral home,” he said. “Especially the funeral, but also the visitation if possible.” He repeated this several times, and also kept saying that the Church should be at the center of funerals, not the funeral home. I asked him why he found this point so important. He’d just finished showing us the beautiful chapels, which he’d clearly invested a lot of resources in. (One of the Orthodox chapels, for example, was complete with a full-sized iconostasis and hand-painted icons.) Wasn’t getting people “back into the churches,” as he put it, bad for business? As he sees it, though, funerals (and funeral homes) serve little purpose outside a traditional Christian understanding of death. Churches, especially those that understand sacrament, are the last places in society that understand the mystery and dignity of death. The Church and the funeral home are not in competition but in an almost symbiotic relationship. The funeral home, to not only survive but to do so in a meaningful way, needs the Church. “Funeral homes are selling something people don’t want,” he said. “The Church has something everyone wants–hope, faith, etc.–but it’s not selling it.” I got the distinct impression from G. that he thinks the Church, generally defined, isn’t doing enough to evangelize or bear witness to Christ in a way people actually understand. And I sensed that, for G., the need funeral homes have of the church extended beyond a mere business mentality. That he found something truly meaningful–almost ministerial–in the way he serves the dead and the living. There is a lot of fallout of secularism, but one of them we don’t often think about is the way it minimizes the dignity we afford to the dead. It denigrates the time we take for them, the rituals we afford them, the ways we grieve them. And on this subject, I could detect both fear and sadness in his eyes–not because this trend could have consequences for his industry, but because this could have consequences for humanity. “It’s not about how we value death,” he told us at a later point in the conversation. “It’s about valuing life.” How we treat and care for the dead directly impacts–and is impacted by–our regard for human life. Towards the end of the meeting, we left G. with a sheet of priorities we are working toward in Orthodox communities in Toronto. Our class is part of a larger project to develop resources for Orthodox in the area to learn about traditional funeral and burial options available to them. With that in mind, many of our priorities focus on starting a conversation about traditional burial alternatives–giving people options to have simpler and more age-old burial options. This entails trying to undo decades of death denial in our broader culture. But one priority didn’t have much to do with death at all, it just focused on better integrating people into churches and ministries in general. G. liked that priority the most. “Get people back into the churches,” he repeated. His point was this: be the Church, which necessarily has an important story to tell about death and resurrection, and everything else will fall into place. If the Church would get back into the business of preaching hope (real hope) in the face of death, people wouldn’t have to jump through all these hoops to deny death. They would listen. For G., why would anyone follow in the direction of Christianity if it can’t (or won’t) stand up to death? Why bother? 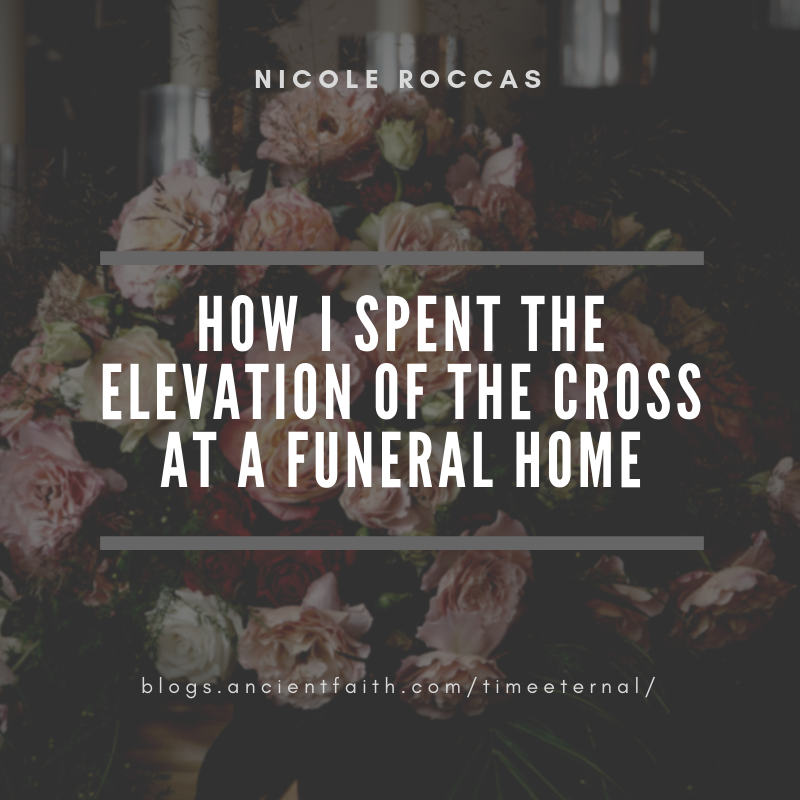 So the next time you find yourself just milling around on a Feast of the Elevation of the Cross with nothing to do, might I suggest hitting up the local funeral home. It’s one of the few places left in mainstream society that will not just talk about death, but be willing to face it–in the flesh, with dignity, hope, and possibly also a few admonishments I think the Church needs to hear. 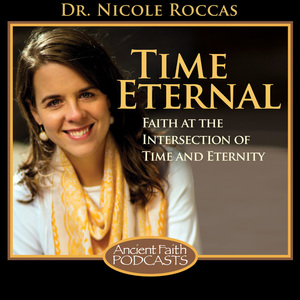 If you liked this blog post, be sure to check out Season 4 of Time Eternal, which is all about death and time. Here’s a good place to start. If you want to support Time Eternal and my ongoing content development work, check me out on Patreon! This funeral home sounds much better than any I have ever been to! Aside from the awning, the funeral homes I have been to have been very different; smarmy and fake-feeling. If there is a funeral home in our large metro area with an iconostasis, I haven’t seen it. Our parish conducts funeral services at the church though, just like that wonderful director knows is so important.